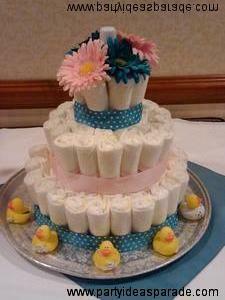 Find Baby Diaper Cake Ideas for your baby shower. Diaper cakes are the cutest gift ideas, but they are also very useful items. They come stocked, not only with loads of disposible diapers, but lotions, stuffed toys, and lots of other baby accessories. All the stuff a new mom will need when she brings her newborn baby home from the hospital. Diaper Cake Directions are on the way...but, they are not here yet. It's not that difficult to make your very own diaper cake for the next baby shower you go to. When we get the directions you will see just how to make one. Of course you choose the color depending on the gender of the baby...if you don't know then choose a color like green or lavender or yellow. Something neutral. Look at the homemade baby shower diaper cake my girlfriend made for her daughter's baby shower. Isn't it great. She had three cardboard cake boards in three different sizes, newborn size disposible diapers and lots of elastic bands. She also had some ribbon and some silk flowers. She rolled each diaper up and put an elastic band on it. It looked like an egg roll...so you get the idea. Then she made a layer of these egg roll shaped diapers standing on their side. When her layer was all filled in she wrapped a piece of ribbon around it to hold them all in place. Then she put the second cake board on top of all those diapers and did it again. When that layer was finished she started on the top tier. She then finished it off by adding the last strip of ribbon and then she hot glued some silk flowers to complete the look I love it. It is so simple yet very pretty. And really easy to do. Here are some pretty popular baby diaper cake ideas for you to look at.